Dramatization of a U.S. propaganda broadcast to Japan. Friday, May 2, at 4 and 9 p.m.
Saturday, May 3, at 5 and 11 a.m.
Ono, a resident of Little Tokyo and a volunteer at the Japanese American National Museum, unveils a longtime family mystery about what his father, Sam Masami Ono, did during World War II. 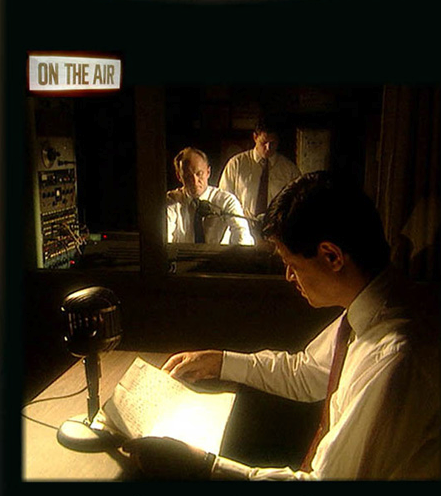 It reveals the secret and presents an intriguing story about his father and a group of West Coast Japanese Americans who as civilians played a critical role in the Allied strategy of broadcasting propaganda to Japan via short-wave radio. Like the Japanese Americans who served in the U.S. military and whose accomplishments are now legendary, these civilians did so even while their family members and friends were held prisoner by their own country in crude, isolated camps surrounded by barbed wire and harsh elements. The Office of War Information (OWI) and the British Political Warfare Mission (BPWM) produced regular short-wave radio broadcasts in hopes of convincing Japanese political and military leaders to surrender. The work was considered top secret and some broadcasters never even told their spouses what they were doing. These Japanese American radio broadcasters would provide news reports combined with music. The broadcasts were entirely in Japanese and required a high level of proficiency in translation. It has been estimated that less than 70 non-Japanese individuals could speak Japanese in the U.S. when the war began, so the language skills of this group of broadcasters was rare. These Japanese Americans were mostly Kibei, U.S. citizens partly educated in Japan. Their unheralded work, vital to the joint U.S. and British wartime effort, is finally told through actual recordings, interviews with the participants, and re-enactments. Ono, a Sansei from San Francisco, was awarded a California Civil Liberties Public Education Program grant in 2001 to produce the documentary. He has moderated education programs on the subject at JANM. In the Chico-Redding region, “Calling Tokyo” will air on May 2 at 4 and 9 p.m. and May 3 at 5 and 11 a.m. on KIXE DT3.